With dance, live music and dialogue compiled from the performers’ personal experiences, Border Tales looks at post-Brexit Britain seen through the eyes of its international cast. 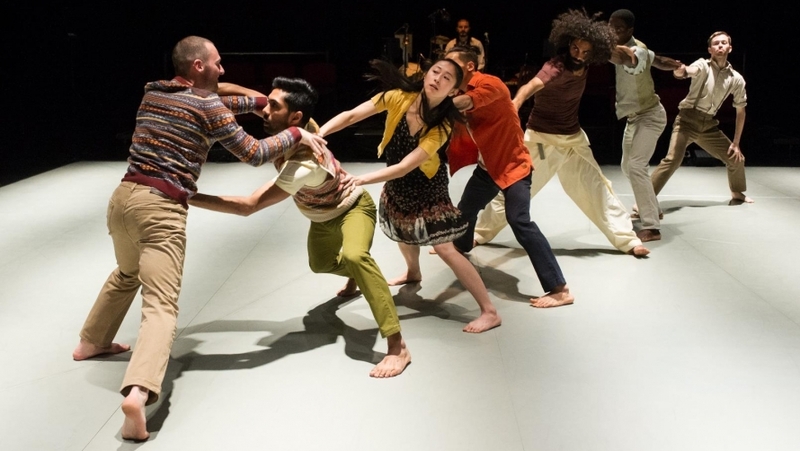 Following a phenomenal run at Edinburgh Festival Fringe to sold-out audiences, Protein Dance’s artistic director Luca Silvestrini answers some of our questions. The show has been in development for many years. What was the inspiration for Border Tales back in 2013? Partly, it was the beginning of the migrants’ crisis, with more wars happening around the world. In 2011, David Cameron commented that multiculturalism wasn’t working in the UK. This was the bigger picture and then the more personal picture was that after nearly 20 years in the UK I came across a sense of “Who am I? Am I English or Italian or something in between? I’m not one or the other.” In Italy I was finding it difficult to speak my own language. I discovered a sense of ‘in-betweenness’, of feeling a little bit foreign in your own country. Identity is not something that is given to you at birth, it’s something very fluid that keeps shifting and surprising you. This is what prompted me to start a long period of research with non-performers – I did a lot of interviews and workshops with people around the UK and also abroad, listening to their stories and opinions. How did you create the work? Was it a collaborative process with the performers? I auditioned to find the right performers who, like me, felt the need to share their thoughts and stories. Once in the studio I shared my findings with them, but their stories were much more present and needed to be told. The performers’ realities became the show. It was also very important to collaborate with the composer Andy Pink and musician Anthar Kharana throughout. What role did the Brexit vote play in reviving/reworking it? Are there any main differences between the original production and the new version adapted for a post-Brexit audience? What was maybe the beginning of a world crisis became one and then we got Brexit, Trump, a lot of negative policies in Europe around borders and stopping migration. Suddenly this work became very relevant and important, even more so than it was in 2013. It was almost a forced choice, it would have been silly not to restage it for today. I haven’t changed much, probably a few lines. What has changed is my ability to look back, pare it down and edit. I made it more focused on the people onstage. In 2016 we were invited by the BBC World Service to stage a half hour extract from the piece for a programme based on identity. That invitation convinced me to bring Border Tales back. The work includes speech as well as dance. What shaped your decision to include text along with movement? At Protein we create dance theatre experiences based on real life. I consider words to be as important as movement to embrace and communicate with an audience. I found that there are certain things that cannot be said with movement and certain things cannot be said with words. So ideally I’m trying to find a holistic way of communicating. Are you looking forward to touring the show? What do you hope audiences will take from the piece? What message or effects are you hoping to convey? Yes I’m really looking forward to it. In 2014 the tour was short so I always felt I needed to take it around more. We had a very successful run at the Edinburgh Fringe this year and that confirmed to me that the piece is important. It’s about culture and identity. The piece doesn’t make a final statement but those are the subjects and I decided to go down a certain route. So it’s a piece that encourages debate and conversation and that’s what I care for. It’s not just a piece of entertainment. Having taken Border Tales to Edinburgh Fringe Festival 2017 and toured the show in the autumn last year, we are really looking forward to start again in spring, visiting UK and international venues. You can catch Border Tales at Warwick Arts Centre on Tue 24 Apr 7.45pm. For more information and tickets click here.